Under direction of Director and Associate Director, coordinate strategic communication planning and implementation for UCHRI and the UC Humanities Network. Provide creative directorship of UCHRI’s brand identity with special attention to website development and content maintenance, in addition to other public-facing outlets such as email newsletters, public programming, and fundraising materials. In collaboration with Associate Director, grow and manage social media presence and networking strategies to showcase UC humanities research and UCHRI projects and programs and help build the Institute’s various relationships. Provide statistical analysis of social media outreach strategies and provide recommendations for experimentation and greater audience outreach and engagement. 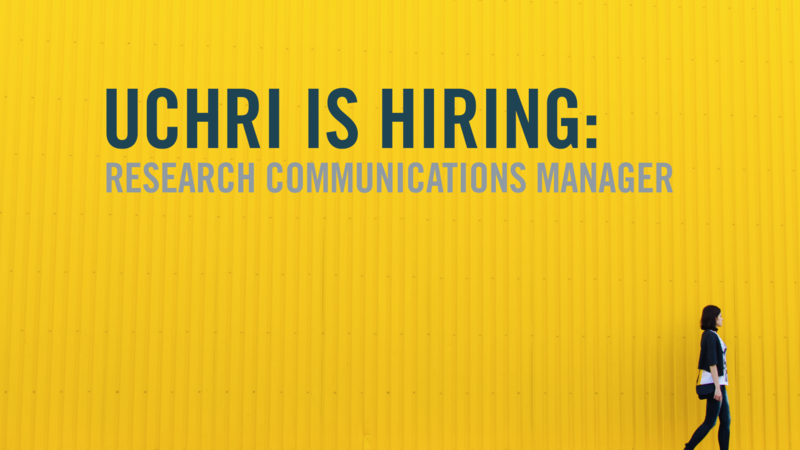 Oversee creative video productions and multi-media for all of UCHRI’s programmatic initiatives. Oversight will include the supervision of the undergraduate media assistant. In collaboration with UCHRI’s program team, contribute to the development of UCHRI research initiatives and programs. Assist Director and Associate Director with identifying, writing, and formatting external grant applications. In consultation with Director and Associate Director, develop and conduct research relevant to the Institute’s mission and its programs, to which the candidate’s own research interests would contribute and from which they might benefit. Assist with programmatic and logistical concerns relating to UCHRI events. Bachelor’s degree in humanities-related field; or equivalent combination of education/experience. Experience working in academic or liberal arts institution/organization, with an emphasis on humanistic research. Understanding of academic and educational functions of major research university. Deep understanding of and appreciation for academic and humanistic enterprise. Ability to articulate academic values to diverse constituencies. Superior research, writing, editing, and proofreading skills. Experience in new media communications, social and digital media (e.g. Facebook, Twitter, Instagram, blogging, podcasting, etc.). Experience designing and working with websites (e.g. WordPress), email tools (e.g. Mailchimp), and design and video production programs (Photoshop, InDesign, Premiere Pro, After Effects and others). Demonstrated ability to manage multi-faceted programs and projects. Demonstrated ability to work and prioritize in a multi-project, deadline driven environment. Proven ability to work both collaboratively and independently with little supervision. Have strong attention to detail and follow through. Ph.D. in a humanities-related field, completed and in hand prior to start date, or equivalent combination of education and experience. Demonstrated experience working with faculty, graduate students and administrators within UC system and with diverse publics outside the academy. Workplace and interactive flexibility, which is vital, as this is a diverse, distributed team environment. Knowledge of data collection/analysis tools (such as Qualtrics, Excel, etc.). Occasional travel in California and out of state. As driving will be required for this position, you must possess a valid California Driver’s License or ability to obtain one as required by the California Department of Motor Vehicles. Final candidate subject to background check. As a federal contractor, UC Irvine is required to use E-Verify to confirm the work status of individuals assigned to perform substantial work under certain federal contracts/subcontracts. (job number 2019-0051). Please attach your resume.